I began making jewelry with precious metal around 1970. I started out as a self taught goldsmith until 1986, when I went to the Revere Academy in San Francisco for formal goldsmithing instruction. 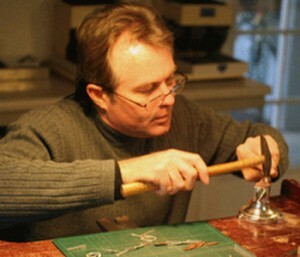 I have maintained a private studio practice for over four decades, creating a body of work that has won awards from the World Gold Council, the American Jewelry Design Council, and Jewelers of America New Designers Gallery. My jewelry focuses on minimalism in precious metal and has been represented in select galleries across North America. In 2005 I joined the faculty of the Revere Academy, where I taught marketing and goldsmithing classes through 2017 when Alan Revere retired and closed the school. I currently teach workshops and master classes in applied techniques of goldsmithing and silversmithing, as well as design, creative and professional development classes and seminars internationally as a visiting guest artist. In addition to offering my annual winter series of In Depth Retreats and private instruction in my Scottsdale Arizona studio, I am available for personalized individual consultation and mentoring. My work has been featured in more than 90 magazine articles within the past two decades.